Another stern stock market crash warning was just issued from the International Monetary Fund (IMF), and it's fueling fear across global markets. The IMF, an organization of 189 countries, is worried about the ripple effects should the United Kingdom vote to leave the European Union (EU). A British vote to exit the EU, or "Brexit," could have significant and negative effects on the UK economy, the IMF said last Friday. The quickly approaching Brexit voting date is June 23. Christine Lagarde, the IMF's managing director, said nothing positive could come from a Brexit. She cautioned a vote in favor of a Brexit could lead to a technical recession. Bank of England Governor Mark Carney shares a similar sentiment. A Brexit vote would cause a "protracted period of heightened uncertainty" and "severe regional and global damage," the IMF warned. A spike in interest rates, extreme financial market volatility, and damage to London's revered status as a global financial hub are all likely outcomes. Other concerns include falling stock prices, a plunge in real estate values, surging borrowing costs for businesses and households, and a steep drop-off in foreign investment. The UK's economy could contract by 1% to 9% following a Brexit, according to the IMF's research. If the UK chooses to stay in the 28-country bloc next month, the IMF expects the economy to grow about 2% this year and around 2.25% in 2017. And the issue isn't isolated to the United Kingdom. 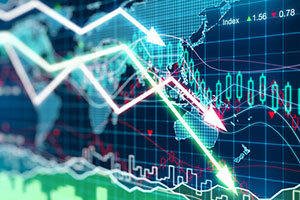 All global economies will be affected, which is what has sparked the stock market crash fears. Atlanta U.S. Federal Reserve President Dennis Lockhart said last month that a vote for the UK to leave the EU might have destabilizing consequences for the world economy. It will also weigh heavily on the FOMC's decision to be patient in June about raising rates. The Fed meets June 14-15, a week before the Brexit vote. Dallas Fed President Robert Kaplan echoed that sentiment. Kaplan said in February that a Brexit presents a risk to global stability, adding that central banks are "watching it carefully." Still, Brexit has supporters. They include UK government ministers. Proponents argue that quitting the EU would ultimately make Britain richer by facilitating freer trade with other parts of the world and by lessening the burden of regulation on businesses. But in the event of a Brexit, it would take years to renegotiate deals with the EU and other countries. During that extended time, investment and economic sentiments would be hit hard. Soft corporate earnings, rising defaults from companies in the oil patch, and China's ballooning debt are more reasons why we are positioning for a stock market crash in 2016. With Q1 2016 earnings season nearly done, the blended earnings decline for S&P 500 companies is -7.1%, according to FactSet. Q1 2016 marks the first time the index has recorded four straight quarters of year-over-year earnings declines since Q4 2008 through Q3 2009. Earnings for the current quarter are also expected to be soft. It's not until Q3 2016 that company earnings are expected to start showing gains. And despite the 30.1% year-to-date gain in crude oil prices, bankruptcies and defaults from sector-related companies are surging. Some 77 North American energy companies have declared bankruptcy since the start of 2015. This year, 175 oil and gas producers globally are at risk of declaring bankruptcy. More than 160 in the United States are teetering on the verge of bankruptcy, according to Houston law firm Haynes & Boone LLP. China's mushrooming debt is another stock market crash concern. China's debt-to-GDP ratio has been hovering in a range of 240% to 270%. That's a staggering increase from 150% just 10 years ago. That increase has occurred during a time when China's GDP has grown sizably, meaning China's debt load is soaring. According to global consultancy McKinsey & Co., China's debt has quadrupled since 2007. It's been driven by real estate and shadow banking. China's debt as a share of GDP is now larger than that of the United States and Germany. The situation is like a ticking time bomb, and many are waiting for China's fragile bond market to implode. The upcoming U.S. presidential election is also stoking fears stateside and abroad. Money Morning Global Credit Strategist Michael E. Lewitt says investors can take cover in precious metals. That's why we've pinpointed the four best gold stocks to buy in 2016.